Headed to SwitchPoint? Find all the travel details you'll need right here. SwitchPoint attendees can reserve a room for a special rate of $107/night at the Hyatt Place Durham Southpoint using this link. You can drive or take advantage of a Lyft, Uber, or taxi service. Due to the remote location of the conference it may be difficult to secure an Uber/Lyft after the conference. We will have taxi numbers available should you need to call one. When you arrive at the conference, please park in the designated meadow across the street from the Haw River Ballroom (see diagram above). Parking attendants will be onsite to direct you. Breakfast and lunch are included in your conference registration and will be catered by the Eddy Pub. 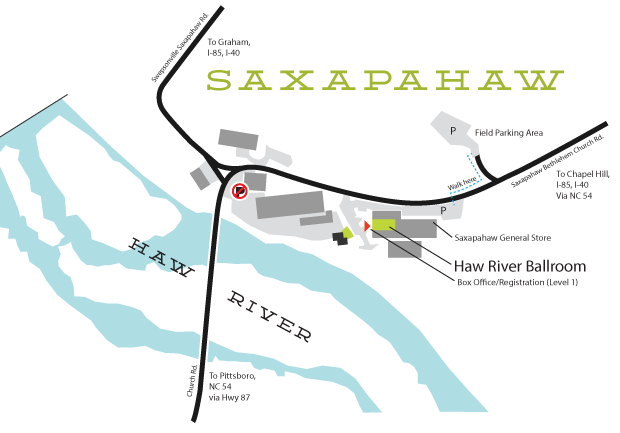 Saxapahaw dinner options for Thursday and Friday nights include the Saxapahaw General Store and the acclaimed Eddy Pub. Picnic down by the river, enjoy a coffee from Cup 22 on the Haw River Ballroom deck, or grab a beer from Haw River Farmhouse Ales. SwitchPoint is an unusual gathering in an unusual setting. You won't sit in any conference rooms here. Instead you'll be in and around the Haw River Ballroom, a beautiful, award-winning space set in the former dye house of a historic cotton mill. And you'll be surrounded by the charm of Saxapahaw, a tiny, historic town in the beautiful North Carolina Piedmont. Come get some fresh air and find out what makes SwitchPoint a conference like no other. Dress is casual; the conversation won't be. IntraHealth International is the proud producer and host of SwitchPoint. We're on a mission to make sure everyone everywhere has the health care they need to thrive. And we know that creative, unexpected partnerships can help us achieve that. Find out more at IntraHealth.org.